The temporary care for domesticated cats at home is called cat sitting. As a cat owner you look for sitters to stay with your feline pets while you are away, keeping them safe and comfortable in their own home. At HouseSitMatch.com we can help you connect with ID and Police checked sitters to care for your pets. 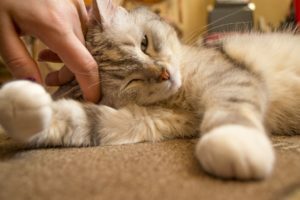 Despite the reputation that cats have of being independent, pet sitting for cats is important way of carig for cats, and is becoming increasingly popular, especially because some breeds are prone to show signs of anxiety with any change in routine or circumstance. Caring for young kittens and older mature cats in their own home can also be a major benefit of cat sitting. Due to their young or old age they can be more vulnerable to any change in circumstance. The many different breeds of cat present varying personality traits and habits, this can become more obvious when they are left when owners travel away from home. The standard moggy may be placid, a live-wire, playful or fearful of new company – so when pet sitting for cats the sitter should take time to get to know the cat’s personality before wading in. Vet Matthew Bayliss offers some excellent top tips for cat sitters owners when preparing for a catsitting. 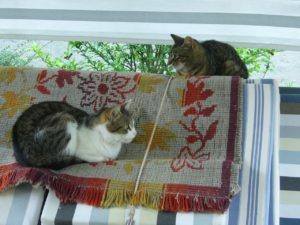 Professional cat sitters – They are available in most towns and generally charge you a daily rate. 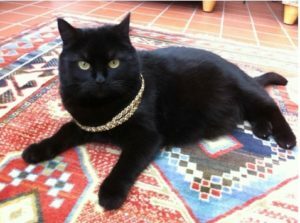 Catteries – Professional organisations to care for your pet cats, on their premises, for a daily charge. Checked live-in house sitters – These sitters will offer in home pet care to cherish you pet cat in your absence. One way to alleviate any stress for your cat (or cats!) is to have the sitter move in to the cat’s home, and to ask for a meet and greet with the sitter prior to their time alone with your cat. During the meeting it will be beneficial to discuss any pertinent notes on your cats behaviour, feeding regimen, when they like to go out (and come back in), and other daily routines like sleeping patterns, their favourite toys and methods of play. To find checked live-in cat sitters register with HouseSitMatch.com as a homeowner and look on our Find a House sitter directory. Regarding moving the litter tray, experts agree that this can be as stressful for cats as moving to stay in a new location. Be sure to ask the sitter to maintain the location of their litter trays especially you are away and they are in charge. A great way to establish trust between the sitter and your pet is to run this meet and greet and get them playing together or at least be aware of each other. Familiarity of smells does help to minimise any separation anxiety they might experience. Pet sitting for cats will often include regular brushing and grooming of the pets especially with long hairs. The act of grooming and brushing the cats can help enormously with relaxing the animal and of course maintaining the condition of the fur. 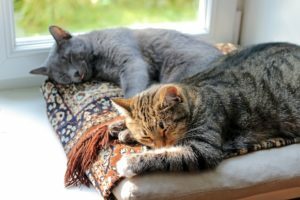 The term cat minding can be used interchangeably with cat sitting, meaning a temporary arrangement to care for a pet cat, usually in the cat owner’s home. The responsibilities will include all that is necessary to care for and maintain the cat’s health and well being from feeding, providing fresh water, grooming, cleaning the litter tray if required and giving of any medication if required. This arrangement can have many advantages not least the fact that cat experiences minimum disruption despite the owner’s absence. 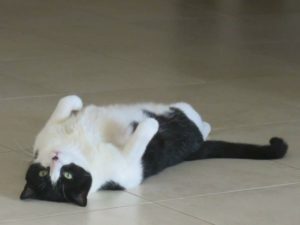 Another major advantage of inviting checked live-in house sitters to care for your cat in your home, is the combination of cat sitting and house sitting. The sitters will care for your cat while keeping your home occupied and maintained in your absence. This can be hugely valuable especially during long term absences when the property may become vulnerable to opportunistic burglars. If a garden is left unattended for too long it can be the first sign that the property is empty and vulnerable. During any holiday period when the owners are absent it may become over-grown and will then be an open invitation to passing intruders. The availability of sitters specialising in catsitting is increasing as more people discover the joys of housesitting as a means to indulge their love of pets, to live like a local in new towns and even countries and travel this way on a fixed budget. My first experience of having a pet/house sitter was just amazing! It happened when the snow storms were lashing the UK and in particular Ireland, where my pet sitter, Claire, is based. It was touch and go that she would get here so I contacted Lamia, explained the situation, and she immediately searched for and found 2 other sitters who were happy to step in if required. Fortunately, Claire was able to get to the airport and arrived the following day. My cats were completely relaxed and happy on my return and the apartment was spotlessly clean and tidy. Everyday Claire sent me a short video clip of the cats either purring, or on her lap being fussed etc., which put me completely at ease as they are both rescue cats and very wary of strangers. Happily, Claire is no longer a stranger here and I cannot recommend her highly enough. To find a checked live-in house sitter to care for your pet cat join HouseSitMatch today as a homeowner it takes just five minutes, and if you need a little extra help with the technology CONTACT US and we can support you in real time. We’re here to help you,!